The past semester, art students in Brett Colley’s class on printmaking, invited me to come talk about the Grand Rapids People’s History Project. 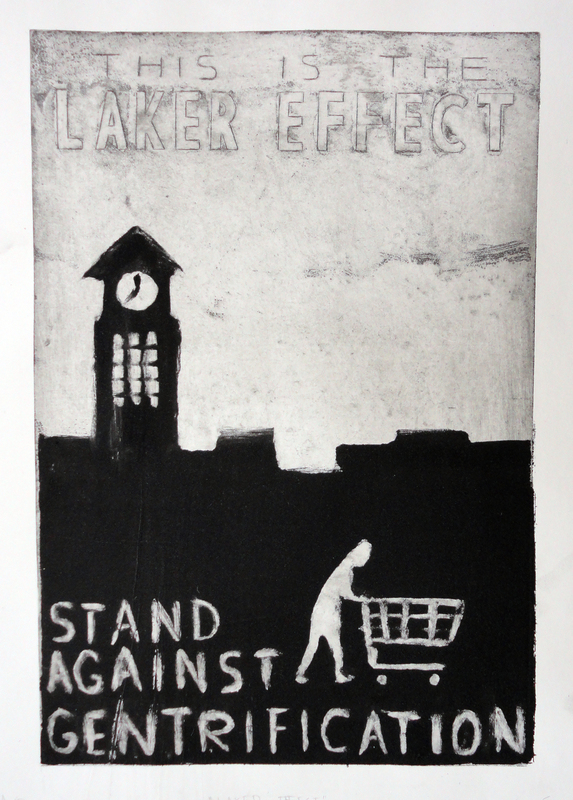 The intent of the class was to have students investigate their own part of a People’s History of Grand Rapids and then make a print based upon an individual, social movement or a particular moment in history. The first print we feature is from Corey Sorg. This is a contemporary print that both pokes fun at the more recent marketing campaign from Grand Valley State University and challenges the gentrifying role that the university expansion has in Grand Rapids. A recent article from the If The River Swells is the best analysis we have seen on the gentrifying impact by GVSU, particularly in the Belknap neighborhood. The article points out that the role that GVSU has played, in addition to demolishing homes, created larger opportunities for private developers to radically alter the future of the neighborhood. Gentrification’s impact on neighborhoods and communities has a long history in this area, with the early Settler Colonialism along the Grand River to the construction of the highways that run through Grand Rapids. This entry was posted in Neighborhood organizing, People's History Artwork and tagged gentrification in Grand Rapids, GVSU contributes to gentrification, GVSU The Laker Effect. Bookmark the permalink.